It's seven years since the launch of the first Android phone: the T-Mobile G1, aka the HTC Dream, and Google is celebrating the occasion by releasing a few new wallpapers that you can use to freshen up your home screen. We remember counting down the days until the launch of the first Android phone as expectations about the first phone with the new Android operating system were high. And while it was not all that big in terms of specs or features, it did come with a cool slide-out full QWERTY keyboard, a neat trackpad, and of course the fully operation Android operating system. 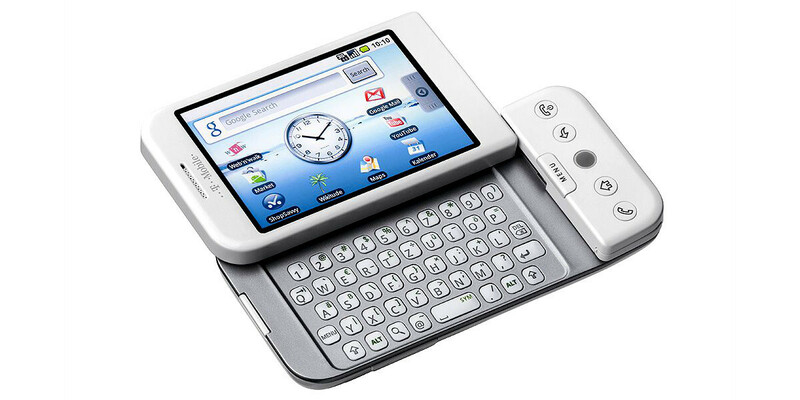 Did you know that back then Android did not even support a virtual, on-screen keyboard officially? Cute, isn't it? Check out our full review at the link below and right after it - the new Google-made wallpapers. We have come a long way from the archaic days to the marshmallow days!!! Bad bad battery life, but I liked it. I started on 1.6 with a Motorola Droid. The jump to 2.1 was a huge leap for Android. Hard to believe the first version didn't come with a pre-installed an email application. I remember when this phone came out. Can't believe it's been 7 years! My dream phone that time.. Then I bought Htc Tattoo..
7 years ago, when Google and Apple were friends united against a common enemy, Microsoft. Now, the tables have turned with Google being the common enemy from Apple and Microsoft. lol. Actually, the primary enemy was Nokia's Symbian OS. Google would be nothing without Windows. If Bing had existed before Google, Google would have never made it big. I left AT&T to get it. I don't remember this phone although I had phones WAY prior to this. I got my first cell in '95 and have had one since. My first Android was Droid 1. Have always been with Verizon. What can I say I'm loyal to a fault. Now the oem company behind the first ever android phone, that is, HTC is struggling and is in serious need of fresh air to come back to life. Love HTC anyway. Too bad they can't keep up with the competition. I'm pretty sure that's also Techie's 7th birthday. Well, happy birthday Techie! Best comment ever! Happy Birthday Techie!! My first Android phone was a Samsung Intercept. Back then, I needed a physical keyboard. However, the Intercept was the worst phone I owned and was NOT a great introduction to Android. When I upgraded, I got the Galaxy Nexus and after that, the G2. So ever since, I have learned that it's best to stick to either the Nexus phones or the company flagship phones. All those "affordable" and "mid range" Androids are definitely not optimized for Android. I remember the launch, though I had no interest since I was on WinMo back then. Then, MS decided to kill WinMo, and I tried to wait for WP, but wound up getting an Android phone to hold me over. Then, WP turned out to have the worst attributes of IOS, with none of the plusses. And Palm/HP fumbled WebOS, so here I am today, still with Android, the mobile OS I never intended to get. This is me too a tee. I had no desire for Android, was a Win Mo user also. I almost got an iPhone. Only difference is I didnt wait for WP. I had no idea about WP until after I got an Android phone. I also didnt want WebOS. I mean I did before the iPhone came out. So much changed after the iPhone launched. Google should had held the marshmallow and the new nexus event today. As a tribute to the first android!